Nashville has so much to explore and see but there are just times when we can’t leave the house (like when we are stuck at home for that 8 AM to 5 PM window for the appliance repair man to come – I know you know what I’m talking about…..). My kids are computer and game junkies (Minecraft, anyone?). So instead of just games I thought it would be great if my kids could learn something in their online play. 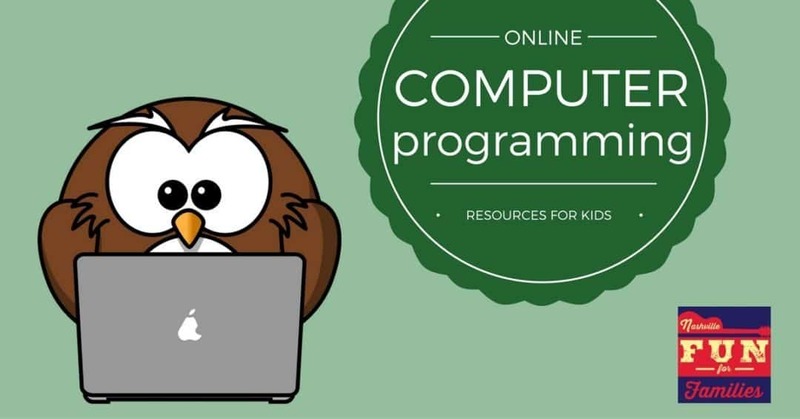 There are lots of FREE resources that help kids learn to code and create their own games. Here is a list of online computer programming resources for kids to bookmark for the next rainy day. Click each number below to check out the programs directly. This is a great place to start and learn about all the possibilities there are out there for computer science. If your kids are looking at you like you are crazy with the idea of computer coding, show them the list of A list stars (will.i.am and Ashton Kutcher), politicians and industry experts that are supporting the movement. American kids need to learn to code! CodeHS is Free to start but does have a fee based membership to continue beyond the first module. For $25 a month you get access to all their course work. For $75 you get access to online tutors and help as you learn to program. Start with some of the free sites but if you have a serious geek (in a good way) in your house and no access to mentor geeks this may be a good way to go. Stencyl is a FREE program that you can download to build your own game. You do not need to know any coding – you just drag and drop commands similar to Scratch. Once you complete your game you can even submit it to be sold in the iTunes App store or the Google Play store for Android. If you have an iPad, Hopscotch could provide hours of fun. It is an App that has similar drag and drop programming to Scratch. It is also FREE. Do you have small kids and are looking at this and saying “this is to old for them?”. Load the next app on to your iPad and hand it to your preschooler – I’m sure you will be amazed! Daisy is the simple version of Hopscotch for the iPad. My 3 year old has been moving the drag and drop commands around to make Daisy walk, spin and jump. When she gets a little older she can use these skills to move into more complicated programs and eventually learn to code. Check out our site for more indoor fun and things to do in Nashville! There are even some free classes and workshops that kids can take to learn to code! Disclosure: These are affiliate links. When you purchase a product, Nashville Fun for Families will receive a small percentage that we use to find more ideas for family fun in Middle Tennessee and beyond.